New website design for Vancouver-Santa: new look that converts. Santa recently hired me to do a new website design for his website for the upcoming Christmas season. 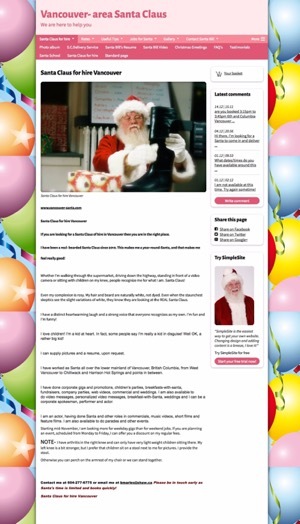 The new website design was to make Vancouver-Santa.com look better and increase business. I updated Vancouver-Santa’s design for a modern look. Before, it did not look professional. I also redesigned it to answer common questions prospective clients may have about hiring Santa, all on one landing page for easy navigation. I selected an image of Santa and his reindeer flying in the evening sky as Vancouver-Santa.com’s header and background image. I chose this background image because it gives Vancouver-Santa the night before Christmas feeling. I also added snow fall to it to emphasize that peaceful feeling. Also, this background image makes Vancouver-Santa pop as part of the website’s redesign process. The image sets the site’s dominant colour as blue and so blue was carried through out the site to match the image, meeting a principle of good design. The fifth, a monthly calendar of his availability to show demand and thus further social proof, along with a map of his service area. Santa can easily update the calendar himself making it a convenient tool for him and his prospective clients. And finally, the sixth, a form for visitors to submit their dates and event details to get a price quote from him after viewing his calendar. As well, I listed his phone number and email for those who prefer to call or email him directly at the very bottom of the site. The number and email are clickable so that people can easily contact him right from their smartphones. The new website design of Vancouver-Santa makes it look polished. It also performs well. It’s easy to navigate; its top menu links to each of the six sections and has a back to top button. It’s easy to read on desktop, tablet and smartphone, and downloads fast. The latter is important as Google tends to list websites higher that give a good user experience. I also added social share buttons to it for easy sharing. 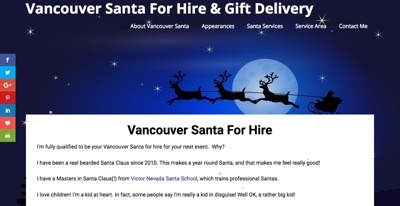 Vancouver-Santa is search engine optimized for the phrase “Santa for hire”. This keyword phrase was found to be the most common phrase typed into Google by people looking to specifically hire a Santa (1K to 10K average monthly services on Google), not searching for information about him. The site is also geo modified for “Vancouver Santa for hire” because people within greater Vancouver are more likely to hire a Santa that serves Vancouver than one from elsewhere. As can be seen, Vancouver-Santa now looks great and answers people’s common questions searching to hire Santa. As people scroll down the site it leads them to a call to action contact form for to contact telephone or email to contact Santa. This landing page funnel design should lead to increased contact and thus more business for Vancouver Santa. If you would like a second opinion of your website, a redesign of it or design and build a new website for you, like what was done for Vancouver-Santa, please contact me. I would be glad to help. Initial consultation is free. What are your thoughts on this post? If you have any comments or questions, please write them below. We welcome and appreciate your opinions.